Sometimes dark and brooding, occasionally sunny and psychedelic, this second album by Coke Weed was recorded live in the studio in just ten days with no overdubs. Once you’ve heard this US outfit’s blend of roots music, psychedelia and dreamy shoegaze-ish moods, it’s impossible to imagine how these songs may have sounded if they’d gone for a more polished approach. In fact, it would be fair to say, by bringing in a whole world of overdubs and studio trickery, it probably just wouldn’t be Coke Weed. 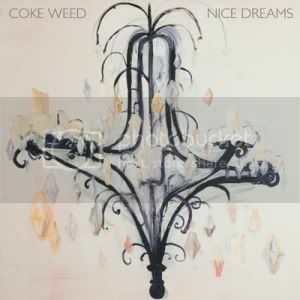 The band picked up a cult following with their 2011 debut ‘Volume 1’ (an album recorded on two tape recorders and given away for free), and those guys are likely to be absolutely captivated by 2012’s ‘Nice Dreams’, although it’s hugely unlikely whether this album will break Coke Weed to a much bigger audience. Across most of this self-released disc the band embraces a twin vocal approach, which, in theory, should have provided them with their greatest strength. It’s a pity with the lack of overdubs, therefore, this male and female duo both spend most of ‘Nice Dreams’ sounding like they’re stoned out of their little minds. At first, it’s almost endearing – after all, those who love Neil Young have always embraced his live-in-the-studio one-take vocals. Before long, though, anything potentially endearing soon becomes hugely irritating. Of course, one would assume the many out of tune vibes elements were included on purpose: some folks have achieved cool with being off-key – look no further than Chrissie Hynde, Deborah Harry or the god-like Thurston Moore – but with these guys, it’s a different story. Assuming they are doing this for effect, Coke Weed strives so hard for coolness via their slackness (something evident right down to their choice of name) that it’s often painful and a just a little embarrassing. On ‘Pure Pattern’ Milan McAlevey’s creaky voice meets echoing guitars and drums, quickly channelling the mood of twangy old country records (albeit played in a garage setting). Something which, at first, sounds like it’s going to be potentially interesting in a Low Anthem kind of way, swiftly sounds very tired, eventually resulting in the band sounding as if they’re mechanically winding down. By the three minute mark, the song sounds like it’s gone on forever with its hideous droning. Much better, however, is ‘No Poem’, a 60s inspired tune weaved around a finger picked guitar. The occasional electric chords provide a pleasing counterpart of the more complex sounds, while the vocals hint at psychedelia. The harmonies aren’t especially tight (well, not at all, in fact), but keeping with the mood of the period Coke Weed set out to evoke, it doesn’t matter. The guitar work alone makes this one of the album’s better numbers. With a blend of stompy bass drum and loud twang, the intro to ‘Magpie’ promises good things. The understated vibes combined with Nina D’s breathy vocals provides a good example of what Coke Weed does best, but it can still make pretty difficult listening. For three minutes, musically, there’s barely any shift from what’s offered during the intro: the guitars and drums amble while Nina channels a shoe-gazish voice. The closing section turns up the volume, though not the intensity or the enjoyment. More dream-pop elements sit at the heart of ‘Someone So Young’, which has an opening verse which could almost pass as a Mazzy Star left-over, with Nina’s voice echoing over softly plucked guitar strings. By the time the whole band come together for the chorus (forcing Nina to increase the volume), the magic is lost, with the piece eventually turning into little more than another tuneless waltz. The upbeat ‘Golden Apples’ has a jaunty mood which borrows from the late 60s, where Coke Weed shows a slight Velvet Underground influence. For reverbed guitars it’s a high point for sure, and the verses are musically interesting, with Nina’s vocal channelling Nico and Sonic Youth’s Kim Gordon. The chorus melody could also be commended, with its optimistic feel. The vocal delivery may not appeal to all, however, sounding not unlike The Mamas & Papas after a particularly heavy night. In terms of lasting appeal once the album has finished, it’s one of the band’s most enduring numbers. If only ‘Nice Dreams’ could have included more tunes of this relatively feel-good nature, it could have been instantly improved. There are a couple of reasonable moments to be cherry-picked on this release [reasonable, in this case, is about as positive a compliment as this particular reviewer can muster] – it’s just a pity that some of the out-of-tune elements make even those so difficult to listen to. If you loved Coke Weed before, it’s highly likely you’ll continue to be enthralled by their mix of old Americana, psychedelia and dream pop from the world of the garage. For everyone else, before deciding whether to listen to this album, ask yourselves these questions: Will I like being whisked into a world of songs that sometimes sound like She & Him, only played badly by a band trying far too hard to be retro-cool? Does my record collection need an album which is potentially moulded from good influences but ultimately has no grasp what made any of those influential artists great? Do I have a lot of time and patience? If the answer to any of these is “no”, then forget it. A new twelve minute interview with Soulfly/Cavalera Conspiracy mainman Max Cavalera has been posted on YouTube. The interview was conducted by Captial Chaos on March 25th, prior to Soulfly’s headlining performance in California. You can view the chat below. Soulfly’s eighth album, ‘Enslaved’ was released in March 2012 and featured the band returning to a more “brutal” metal sound, as practised by Cavalera Conspiracy. You can watch Cavalera Conspiracy’s full performance from Hovefestivalen, Norway 2008 by clicking here. In 2011, it was announced that Paul Simon was to release a 25th anniversary edition of ‘Graceland’. It has been announced that the deluxe reissue will be released on June 5th in a variety of formats. The new edition of the album will be released on a heavyweight vinyl, CD+DVD set and deluxe 2CD+2DVD set. “Under African Skies” documentary – The story of the making of Graceland, and the controversy created when Paul Simon went to South Africa to record with local artists, is told in “Under African Skies,” the new full-length documentary from two-time Emmy, Peabody Award winner and Oscar-nominated filmmaker Joe Berlinger (“Brother’s Keeper,” “Metallica: Some Kind of Monster,” the West Memphis Three/”Paradise Lost” trilogy).Featuring interviews with key anti-apartheid activists of the time and such musical legends as Quincy Jones, Harry Belafonte, Paul McCartney, David Byrne and Peter Gabriel, “Under African Skies” travels with Paul Simon back to South Africa, 25 years after his first visit, and recounts the making of the record, surveying from the vantage of history the turbulence and controversy surrounding the album’s genesis. The four disc edition will be housed in a hardback, cloth covered book which includes new essays and copies of Simon’s own handwritten lyrics. Fans can expect the four disc edition to retail between £70-£80. Although expected to appear at some point this year, the German power metal band Masterplan have delayed work on their fifth album. Guitarist and founder member Roland Grapow (ex-Helloween) has been busy with other projects and has finished mixing new material by Spanish band Saratoga and Australia’s Black Majesty. He says writing has been going well with regards to new Masterplan material and the band now have “15 songs written”. Scandinavian vocalist Jorn Lande rejoined Masterplan in 2009 having been replaced by ex-Riot man Mike DeMeo in 2006. Metal titans Metallica have already sold out five Mexico City dates on their current tour. Shows on August 1, 2, 4-6, 7 sold out quickly and due to fan demand the band have added a sixth date. Mexican fans can now catch Metallica at the Sports Palace, Mexico City on August 9th and witness a lengthy live set which is said to revisit various eras of the band’s history. The current Metallica live show is said to be twice the size of that seen on the ‘Death Megnetic’ tour, which began in 2008. UK fans will next witness the Metallica live show in June when Lars and co headline the 10th Download Festival. A special set will include the 1991 multi-million selling ‘Black Album’ (official title ‘Metallica’) played in its entirety. Some thoughts on Metallica’s 2011 collaboration with Lou Reed can be read here. Metallica’s complete performance from Sonisphere Sweden 2012 can be seen here.